In June 2018, Klayton Tietjen participated in the Semaines d’études médiévales in Poitiers, France. 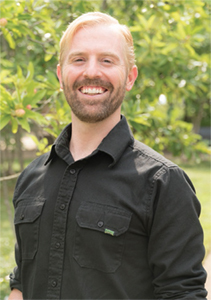 Marco’s Paul Barrette fellowship helped cover the costs of this unique program for Klayton, a PhD student specializing in medieval French epic in the UT Department of Modern Foreign Languages and Literatures. The two-week long series of conferences and historical site visits was organized by the Centre d’études supérieurs de civilization médiévale (CESCM) of the Université de Poitiers. This annual seminar is conducted in French and brings together approximately 50 international doctoral candidates and young researchers. Experts from around the world lead the interdisciplinary lecture sessions and excursions to the Romanesque cathedrals and castles around Poitiers. Participants had access to the university’s library resources, were taken on a behind the scenes tour of the departmental archives, and learned about the techniques involved in the ongoing restoration work to some of Poitier’s 11th-century cathedral murals. Among the many exciting aspects of this invaluable learning experience, Klayton managed to find lodging in an apartment in a remarkably well-preserved 16th-century mansion not far from the CESCM campus in the medieval heart of Poitiers. 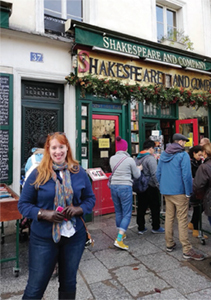 As the recipient of Marco’s Van Hook Fellowship, Alexandra Garnhart-Bushakra, a fifth-year doctoral candidate in history, spent three weeks in Paris in fall 2018. Alexandra traveled to the French capital in order to examine twelfth-century manuscripts at the Bibliothèque nationale de France. This research is part of her dissertation, “If Life Were Verse: Masculinity and Memories of Violence in the First Crusade Narratives,” which focuses on gendered imagery in warfare and how monks redefined Frankish masculinity after 1099, as their stories crossed genre and language boundaries. Alexandra stayed in an apartment located within the city center on the Right Bank. Not only was she within walking distance of the archives, but also of Notre-Dame Cathedral, the Shakespeare and Company Bookstore, and the main Christmas market at the Tuileries Garden. She also visited the Musée de Cluny, the national museum for medieval artwork that houses the “Lady and the Unicorn” tapestries, bejeweled reliquaries, and a substantive collection of Gothic sculptures and column capitals. Even the “Yellow Vest” protests, which dominated international headlines, did not prevent her from exploring a few Parisian neighborhoods along the Seine and sampling pastries from her local boulangerie.